Convoso provides a simple to use, yet powerful inbound and outbound call center platform designed to supercharge your call center productivity (contact/list penetration rate, conversions, talk time, etc) by over 300%. Their all-in-one products are equipped with proprietary and market-leading features and functionality that cater to call centers of any size – from outbound call centers ranging from 1-10 seats to inbound, outbound, and blended call centers from 11-1000+ seats. Convoso’s technology and dedicated team members make the entire set up and launch of our platform fast and easy. Whether you’re just launching your call center, or even transitioning from an existing call center provider they guarantee a seamless transition/migration. The biggest benefit of using this software for your call center is that it is great for motivating the agents and increasing productivity. The gamified features like leaderboards make working fun not only for regular agents but also those who are in training mode. It can help your business grow and have high levels of customer satisfaction. The systems require no hardware or phones to make calls as it uses a softphone that just requires you to have an active internet connection. For a big call center that can save a lot of money. Converting lead generation is really important for sales teams and it is seen that 90% of the companies that utilized gamification had better conversions than those who had the traditional systems. With their tools your contact lists would be very high quality and your agents will be able to deal with customers the way they like. It is also open to integration to third party systems so migrating to this software would be very easy. You can use your existing PBX system with this software solution. Whatever your call center type is, the solution addresses every aspect from coaching to monitoring agents. It streamlines work and adjusts as the load increases. As a result your agents will be able to handle more calls and give the best experience. Call centers grow pretty quickly and for that they require scalability which all three products readily provide. Convoso designs solution for your specific needs and allows you to have these solutions at the best price possible. In return, it helps you increase revenue so you get a high ROI. It is fully dedicated to reducing costs on your end. Enterprises have different needs and requirements and no software platform can be perfect in such a scenario. It is futile to try to find a perfect off-the-shelf software app that fulfills all your business wants. The wise thing to do would be to customize the system for your special requirements, employee skill levels, budget, and other factors. For these reasons, do not hurry and invest in well-publicized trendy solutions. Though these may be widely used, they may not be the perfect fit for your unique wants. Do your homework, investigate each short-listed system in detail, read a few Convoso reviews, contact the vendor for explanations, and finally select the app that offers what you require. How Much Does Convoso Cost? 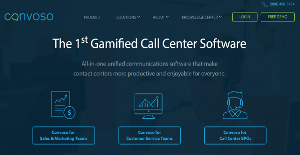 We realize that when you make a decision to buy Call Center Software it’s important not only to see how experts evaluate it in their reviews, but also to find out if the real people and companies that buy it are actually satisfied with the product. That’s why we’ve created our behavior-based Customer Satisfaction Algorithm™ that gathers customer reviews, comments and Convoso reviews across a wide range of social media sites. The data is then presented in an easy to digest form showing how many people had positive and negative experience with Convoso. With that information at hand you should be equipped to make an informed buying decision that you won’t regret. What are Convoso pricing details? What integrations are available for Convoso? If you need more information about Convoso or you simply have a question let us know what you need and we’ll forward your request directly to the vendor.